Marie Caviness has been a long time Highland Lake resident and active in many community functions over the years. 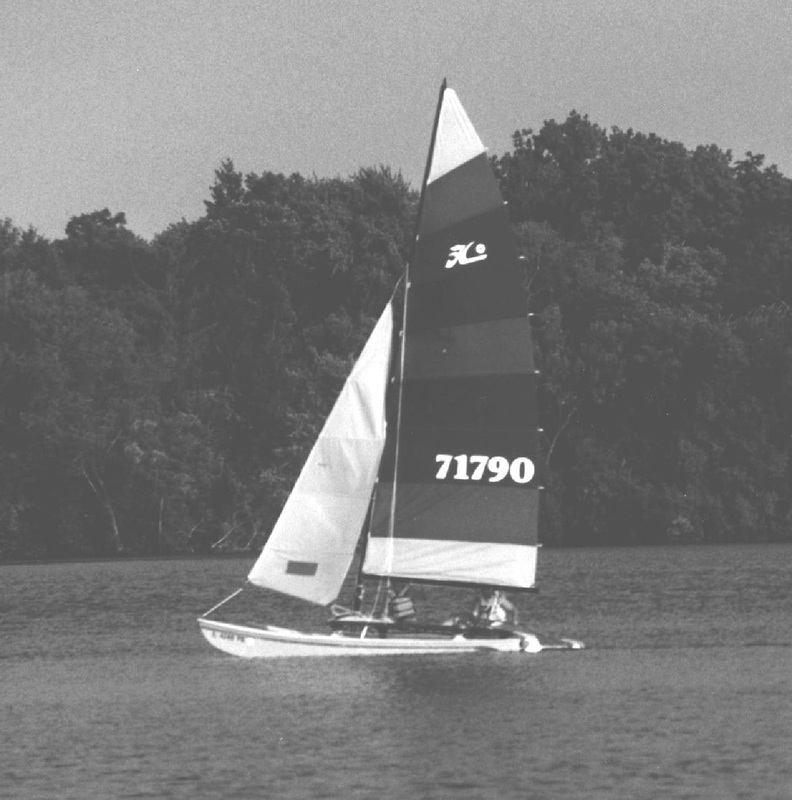 Back in the mid 1990's she spent hundreds of hours developing the first comprehensive book that covers the history of Highland Lake called "Sailing Though Time". Marie began writing this book several years ago after learning that a local history of the area did not exist. She spent many hours searching for photographs, researching historical records, maps, books, newspaper and interviewing several residents to collect information about life here in the early days. We are happy that she has allowed us to post several sections of her book on this site so others in the community can learn about the history of our wonderful lake. Maire did print this book and made available to residents for a small fee many years ago. If you are interested in a printed version she does have a small number of books on hand so just email us at hlcommunitysite@gmail.com. Written by residents of Highland Lake over the years. “We rented this house from a Colonel Thomas. The war was on and he was stationed with the 33rd Division. He said to me, "You better buy it, because I will be gone.’ We bought the house from him. Now, I will tell you how things change. He said, "When the tax bill comes you will have to pay because the 33rd Division is ordered out and I will be gone." The first tax bill came, I think it is still around here somewhere, was $24.00. Now it is over $300." Taken from the Grayslake Historical Society 29 April 1979 - A Conversation with Henry E. Cunningham at his home on Highland Lake, interviewed by Louise Diechman. Resident Fran Imsande (Dmytro-Smith) wrote a weekly column about resident doings in the Grayslake Times for approximately eight years during the 1960s. 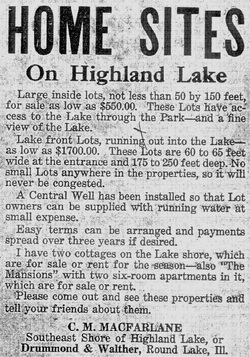 The Highland Lake Property Owners Association (HLPOA) may have been in existence as early as 1941. However, the association was not officially chartered as a not-for-profit organization until October 23, 1959. There are approximately 216 families in the community. Names, addresses and other relevant information for property owners and adopted HLPOA regulations are published in the Highland Lake Resident’s Directory. The HLPOA Board of Directors officer positions include the president, secretary and treasurer and twelve vice presidents who are shore representatives. An annual meeting is held in the spring of each year and a semi-annual meeting is held in the fall. Board meetings are held each month on the third Monday. There was a Highland Lake Ladies Club that began about 1973 and remained in existence for a number of years. Meetings were held once a month. This group held various fund raising projects and events and records show that they participated in the HLPOA Officer’s meetings. from Georgia M. Avery II. Bob Gnarro (right) and Ron Siggeman (left) receiving a Community Service Award from Brad Peek (center) February 16, 1998. 1998 HLPOA Board Members: Left to right: Past President Brad Peek, Georgia M. Avery II, Harry Kirchhardt, Randy Rubner, Jack Fiore, Leo Riley, Elaine Johnson, Adrienne Fosberg, Bob Gnarro and Mark Rosemeyer. There are four parks in the community. Hartnett Park is located on the south shore. The park takes its name from the Hartnett family who donated the property to the association. The Hartnetts’ dedicated the park in memory of Grace Mary Stern. Grace Mary Stern was a family friend and prominent in politics in Chicago, Illinois. The Hartnett family admired her for her generous spirit in reaching out to those in need. The park on the east shore is named Szontag Park. The former owners of the land was the Szontagh family. The park is not owned by the HLPOA. Chic and Downey Parks are located on the west shore of the lake. Sources researched did not reveal information on the naming of the two parks. The newsletter listed below is one of the primary sources of community information. It is thought that it was first issued about June 1975. Volunteers within the community have taken on the responsibility for the design, production and distribution of the newsletter. Over the years, there have been many changes and improvements. The first newsletter was a one-page document. By January 1999, the newsletter had grown to a multi-page publication complete with graphics. The HLPOA became a participant in the Adopt a Highway Program in March 1993. The Illinois Department of Transportation sponsors the program. The area adopted is located on Washington Street from Lakeside Drive to Hainesville Road. Volunteers are provided with neon orange vests and garbage bags. There are four clean up dates each year. Dates are posted in the newsletter. After clean-up there is a fellowship gathering. Residents Bob Gnarro (left) and Hank deGroh (right) working on Adopt-a-Highway clean-up day. August, 1998. Adopt-a-Highway Clean up crew at the Fellowship gathering August 30, 1998. Left to right: Bob Gnarro, Brendan Berry, Greg Boidy, Georgia M. Avery II and Hank deGroh. Highland Lake always has been a source of year-round recreational activities for the residents. In the summer months, swimming, sailing and fishing were part of the summer ritual. Winter months on the lake were spent ice fishing, ice skating, playing ice hockey and in more recent years, snowmobiling. 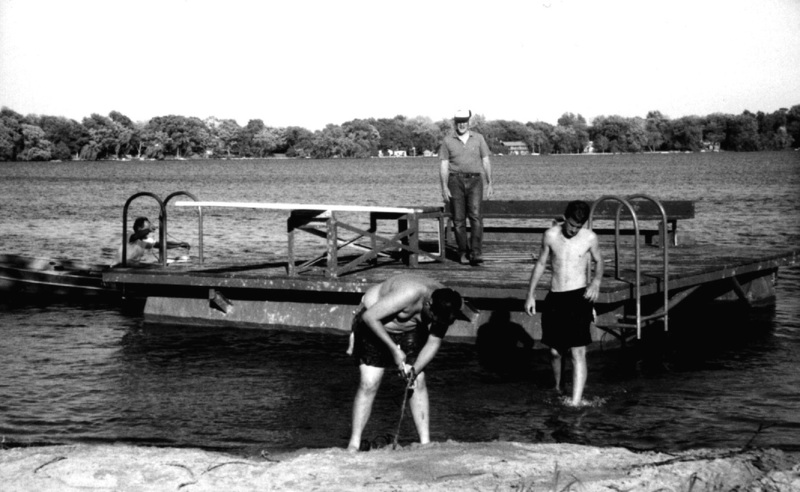 In the 1930s many of the children learned how to swim in the pool at Artemis Park before swimming in Highland Lake. The park was located on the west side of Hainesville Road, approximately one quarter of a mile north of Washington Street. There was a roller skating rink in the park where residents recalled roller-skating as children. One resident recalled a childhood memory of wearing clamp roller skates when skating at the rink. Another resident remembered as a kid he and his friends spent most of the time in the summer months roller skating and swimming and walking from the roller rink to Maxwell’s soda shop in Grayslake. Weekend entertainment in the 1930s included watching prizefighter-wrestling matches at the wresting ring. The ring was located on Washington Street just west of Hainesville Road near the site of the current Avon Township Building. One resident recalled selling sandwiches at the wrestling ring made at Peg Behnings Tavern. The tavern was on the north side of Washington Street across from the wrestling ring. Another resident remembers the prizefighters visiting their summer cottage. Another summer evening activity in the 1930s was watching the "Free Movies” showed in Grayslake and Round Lake. The movies were shown on a sheet that was put up on the side of the buildings. Residents from the 1930s and 1940s reminisced about the enjoyable times spent in the winter months. One resident recalled the day the ice on the lake exploded. It had been quite a severe winter. On one particular cold and clear day, the sun was shining brightly on the lake. There were several children out on the lake ice-skating. The residents thought something was unusual about the lake. Rumbling sounds could be heard coming from the lake. The parents started calling their children in and telling them to hurry and get off the lake. All of a sudden the lake just exploded. The lake was about 15 inches thick with ice and the heat from the sun caused it to expand and explode. Fortunately no one was hurt. Some residents remembered the story of the Highland Lake Sea Monster that was passed down through the years. The following tale about the monster, author unknown, was discovered among old copies of the Highland Lake Hi-Lites. “Some years ago when the sport of wrestling was in vogue this area was not as well built up as it is now. At that time in the rear of what is now the Park Inn on Rte. 134 in what is now Round Lake Park, there was a small arena that featured wrestling by those who traveled the circuit. Sports writers from various metropolitan newspapers covered these matches. There was another watering hole on Route120 just west of 83 that is no longer in existence. This place was unique in that there was a bookcase full of reference books used to settle arguments of those in their cups. This was the gathering place for the sportsmen and scribes. It was here that one night a reporter for the Chicago Tribune was in his cups and feeling little pain but still able to function to a degree. The discussion, as is wont under these circumstances, rambled over a wide range of subjects. Fishing was one of them and at that season, ice fishing in particular. One individual remarked that he did not have the courage to ice fish on Highland Lake because of the "monster" in the lake. This premise was poo-pooed but he held his ground and claimed the "thumping & booming" of the ice covered lake was caused by the monster. Children growing up in the 1950s spent some of their summer vacation time building tree houses, picking berries, collecting frogs, turtles and studying nature. One resident’s earliest memory of life on the lake was of helping her grandmother pick wild black raspberries and making pies and jams. Winter in the 1950s was also a time for outdoor sports. One resident recalled a year that the winter weather was especially dry. 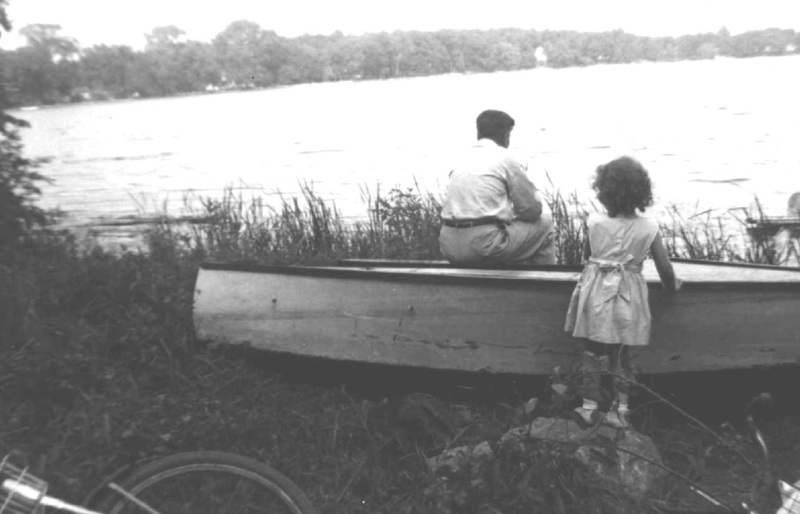 The earliest recollection of a raft on the lake was about the late 1930s. The raft has undergone changes over the years. At one time it was made up of two wooden platforms placed over fifty gallon drums. When the drums rusted out the raft sank lower in the lake and almost had to be pulled out. In the early 1960s the framework was remade and the drums were replaced with tanks that came from a Chicago boiler company. The raft is held in place by a heavy anchor. In the summer of 1964 it was reported that the anchor somehow was lost in the lake and never recovered. For a number of years, resident, Bob Rosemeyer has transported the raft to and from the middle of the lake at the beginning and the end of the summer season. Bob recalled one year the lake level was so low that the raft could not be brought to shore. Bob Rosemeyer (standing on raft), with the assistance of two residents, gets the raft ready for the 1998 season. 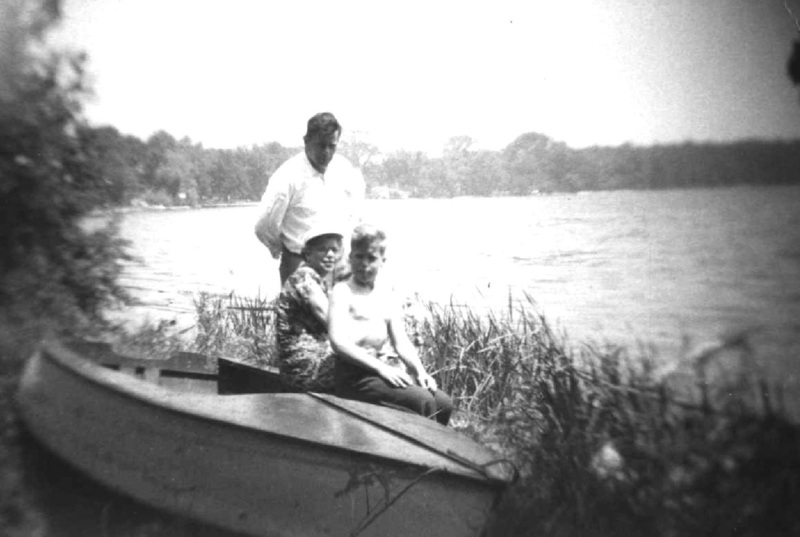 In the 1960s Highland Lake was the home of the “Duck” a land and sea craft owned by resident, Bill Ryan. The duck was used for weed clean up in the lake and provided family fun during the picnics. When Bill bought it in the 1960s it may have been about fifteen to twenty years old. Described as a seven ton, 31-foot vehicle, the duck was equipped to mount a pair of .50 caliber machine guns. It moved at a top speed of fifty miles an hour on land and approximately six miles an hour in water. It was thought that the duck might have been overseas at one time because some Turkish coins were found in it. The Ryans refinished it, installed seats for the driver and one passenger and attached an old locomotive horn in the front. 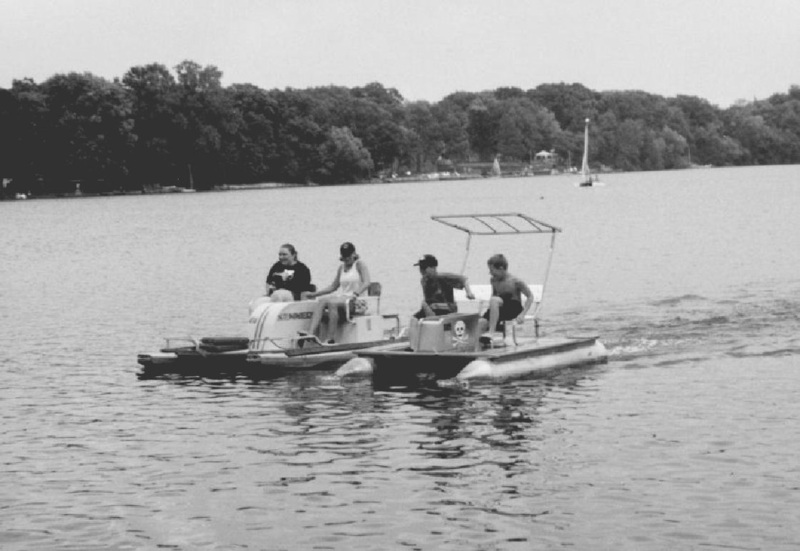 It was the only motorized watercraft permitted on the lake. The duck was made ready for the weed-raking job by attaching a farming hay rake to the back of the duck. A device was constructed to raise and lower the rake. As the duck moved across the lake the rake was dragged along the lake’s bottom to clear out the weeds. It was not long after the duck was brought to the lake that its role expanded into a campaign to keep Highland Lake in tip-top shape. One day when raking the weeds the rake attached itself to something very heavy. The Ryans dragged up a pair of wheels. It is speculated that the wheels may have been disposed of in the lake when the ice house operation ended years ago. On the day of the Highland Lake picnic regular chairs were set up on the deck and people would take turns going for the scenic rides around the lake. There is even a story that the "duck" was taken for a ride on the highway and down to the Chain of Lakes. The duck was in service about six years before being sold. As a souvenir, Bill kept the locomotive horn and affixed it to his truck. Highland Lake around 1933. Photo courtesy of the Lake County Museum, Wauconda, IL. Fishing has been enjoyed throughout the years by many of the residents. In September of 1912, the Grayslake Times reported that two people spent Labor Day fishing for frogs at Taylor Lake. These fishermen or (frogmen) were catching frogs at night by lantern light. Within the span of several hours, they caught 150 frogs. The frogs weighed from one to three pounds. This big catch was identified as the most frogs caught in any of the lakes in the region. Turtle hunting and searching for crayfish, clams and snails and frogs was a big pastime in the early 1940s for the teenagers on the lake. One resident recalled that as a teenager, he and his friend caught frogs in the lake and sold them to the restaurant on the northwest corner of Washington and Hainesville Roads known as Villa Bianco’s Restaurant. A resident reminisced about the summer of 1938 when a cloudburst caused Highland Lake to rise 18 inches overnight. Area residents were boating on the streets and spearing large carp with pitchforks as they swam over the road on their way upstream from Round Lake to Highland Lake. 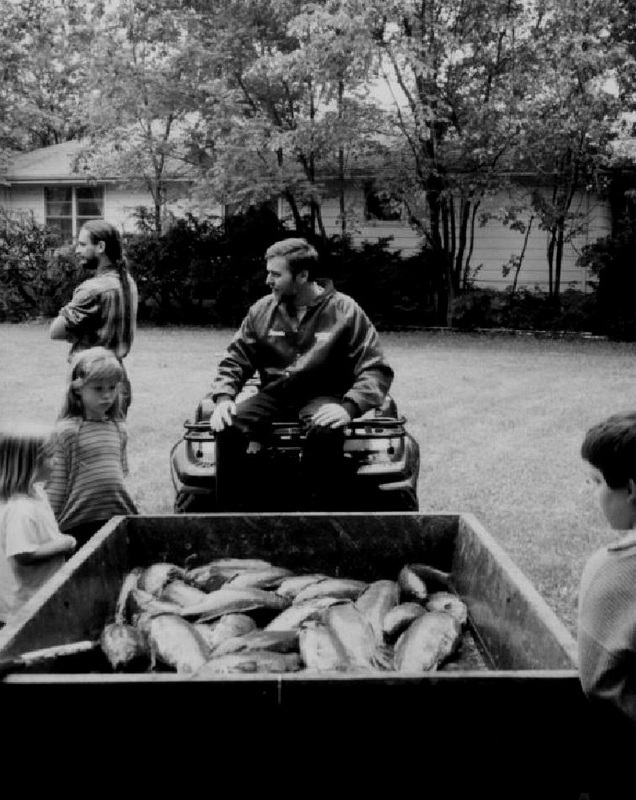 In 1988, the "Highland Lake Bass Busters" was formed to promote fishing and fish conservation on the lake, educate the membership in fishing techniques and create a spirit of friendliness, camaraderie and neighborliness in the community. 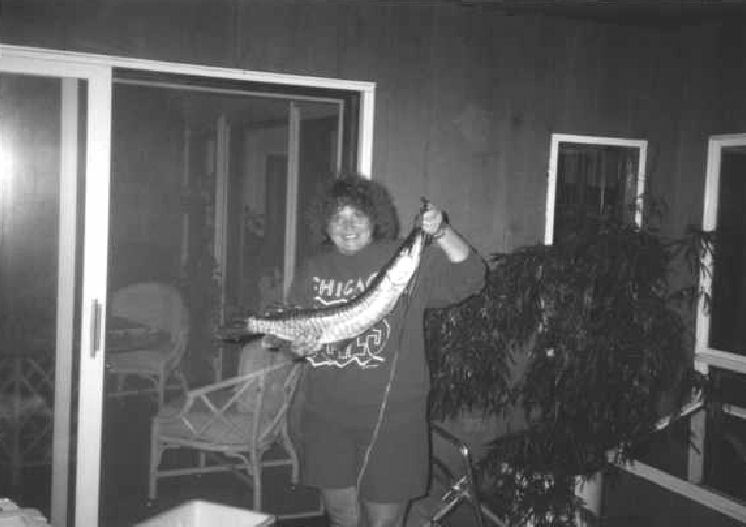 All residents who paid their association fees were automatically members of the "Bass Busters." The name "Bass Busters" was later changed to "Highland Lake Fishing Club." The Highland Lake Open was held in June 1988. This event was a catch and release bass tournament with prizes for the largest bass and highest total weight. In July it was the "TAKF-AKAY-CC" tournament (stands for Take a kid fishing and keep all you catch contest). The original flyers for the tournament had the following statement included; "If you don't have a child the coordinator will find one for you." The statement was cut before final publication. Prizes were given for 1) Largest bass; 2) Most bluegill by weight; and 3) Ugliest fish. 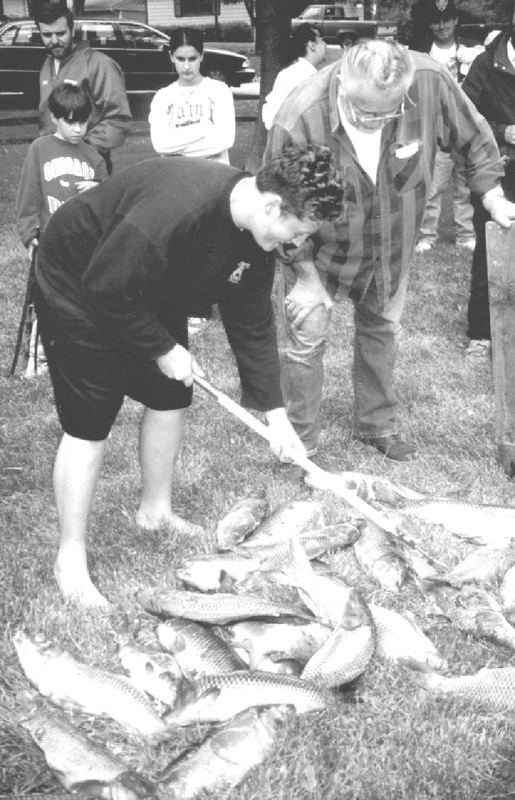 During that same year, the Illinois State Department of Conservation measured and counted fish. Findings showed that there was an imbalance in the bluegill population. It was suggested that the lake be stocked with northern pike and walleyes. By this time the game fish spawning was being ruined by the overabundance of carp in the lake. A CarpFest was started to reduce the number of carp in the lake. The fest is held around the Memorial Day weekend. At the 1996 CarpFest, forty entrants caught 87 carp. A tagged carp was put in the lake and there was a $50 bounty on it. As of September of 1996 that carp had not been caught, so fishermen were given until January 1st and after that the prize when down to $25. It is unknown whether or not that tagged fish was caught. The rains during the 1997 CarpFest resulted in the catching of only 60 carp. At the 1998 CarpFest forty-two paid entrants caught 118 carp out of Highland Lake. Fishing was not only enjoyed in the summer months but in the winter months as well. When the lake is frozen over some residents can be seen on the lake ice fishing. (left) taking out her catch. A participant showing some carp. Danny Williams, (left) and Ron Siggeman, (right) checking the carp. 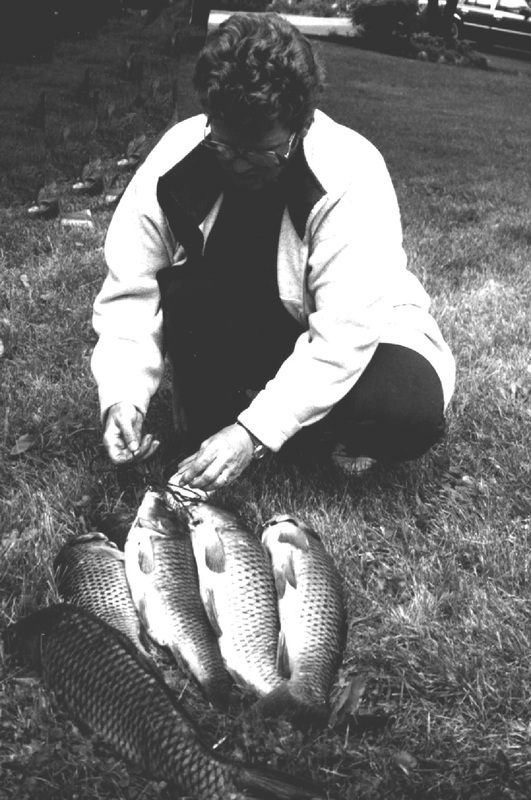 Barbara Jolley displaying her carp catch. For many years the residents gathered for the summer picnic. The picnic of July, 1941 was recalled as memorable. The following story about Highland Lake Picnickers being attacked by “Chiggers” was carried by the Grayslake Times on July 17, 1941: "Many of us are familiar with the old game of ‘button, button, who has the button?’ It wasn't a case of ‘button, button,’ at the picnic at Highland Lake last Sunday, instead it was ‘chiggers, chiggers, I feel a chigger.’ This little insect, which is commonly know as chigger, is designated in most dictionaries as a "chigre", and is defined as a species of flea of the West Indies and South America. But evidently they have wandered quite a way from their native habitat, for there were plenty of them around Highland Lake Sunday, as many of those who attended the picnic can testify. They seem to be more prevalent this year than usual, and really are extremely annoying. It may not be any satisfaction to those who have suffered from this pest, but the dictionary, in commenting on the subject, states that it is the female of the species who burrows under the skin of the victims." 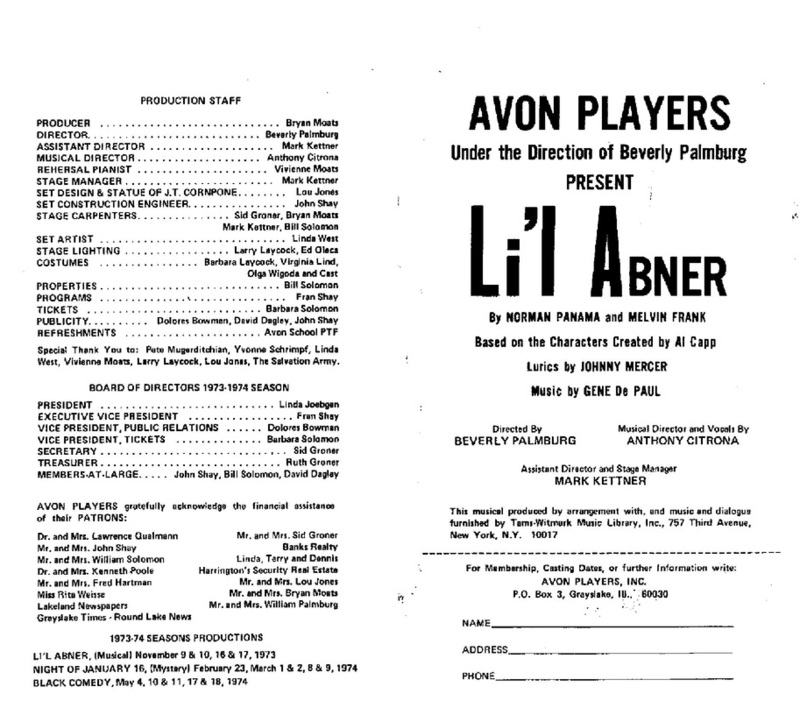 About 1957 residents who were on the School Board at the Avon School, formed the Avon Players Theater group to raise funds to build an “all purpose room” for the school. The successful theater group raised enough funds for the building project. Many of the residents worked along with the theater group on the construction of the schoolroom. In the past, various landowners contributed to the development of the Highland Lake community; one was Leonard Doolittle, who established Doolittle’s “Taylor’s Lake” Subdivision on the northeast shore of the lake. More has been written about the development brought about by Charles M. MacFarlane. About April, 1923, MacFarlane changed the name of Taylor Lake to Highland Lake. A resident recalled that MacFarlane, who was originally from Scotland, chose Highland for the lake's name to remind him of the highlands of Scotland. Although another story was that Highland Lake acquired its name because it was the highest lake in the area. Highland Lake was described as having an enviable reputation in this district, for quiet and respectability. The large home sites could only be used for residences-no business of any kind were allowed. Over the years residential homes replaced the early summer cottages. A resident recalled living in their family’s summer home on the lake and later building a family home. Another resident reminisced about the transition from living in crowded city of Chicago in 1930 to living in the quiet lakeside community. In addition to Doolittle’s subdivision there were other sub-divisions established on Highland Lake. On April 13, 1923 Highland Lake Subdivisions North and South were established along the north and west shores. Highland Lake Manor, established on October 19, 1923, was on the south shore. Another notable house, known as “the mansion,” is on the south shore of the lake. It was built in 1945, in a gothic style, for J. E. Morrison. Morrison was President of the Chicago Poster Advertising Company, one of the largest outdoor advertising plants in America at that time. MacFarlane’s advertisement of the Highland Lake subdivision included a description of the area listed below. On March 1, 1923 MacFarlane became vice-president, treasurer and director of Wilson & Company. Formerly, a highly valued official of Morris & Company and skilled in financial management, he helped build up many banks connected with the Morris interests. He was active for many years in the financial circles of various cities through the States. Born in Glasgow Scotland in 1866, he taught school in his hometown and in 1884 came to the United States and Chicago. He began working for Morris & Company about 1899 as a bookkeeper and was gradually promoted. In 1916 he became vice president and treasurer. He was married and had two daughters, Jean and Isabelle. He was primarily interested in his Country Estate (on Highland Lake) where he bred fancy stock. MacFarlane retired in 1923 from the packing company and spent his time in real estate activities on Highland Lake. He passed away at the age of 87 on August 15, 1953.
distance around 1910. The photographs above are courtesy of Charlotte K. Renehan. Ice was a valuable natural resource in the United States. Prior to modern refrigeration, ice harvested from lakes was used to keep foods cold. Small lakes, such as Highland Lake, provided the best ice because the water was not contaminated by drainage. In 1885 Leonard and Calistra Doolittle owned land on the east end of the lake. On October 5, 1885 Leonard Doolittle sold for one thousand dollars to John and James Griffin and Francis Connolly eight acres of land and water lying at the east end of Taylor Lake to construct a railroad spur to the Wisconsin Central Railroad line. This sale included the right to cut and remove ice from the lake. In December 1886 a large ice house, boarding house, and horse barn were built on the land. Records suggest that the ice operation was originally owned by the Knickerbocker Ice Company but later sold to the Consumer Ice Company. Ice cutting took place in January and February, usually the coldest months of the year. 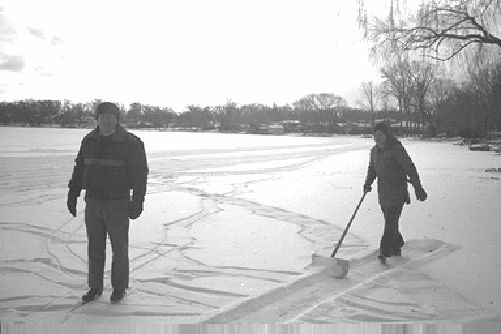 The following procedure, compiled from various sources, may have been used on Highland Lake: Ice had to be at least ten to sixteen inches thick before it was ready for harvesting. Before anything could be done, it often was necessary to move the snow away. 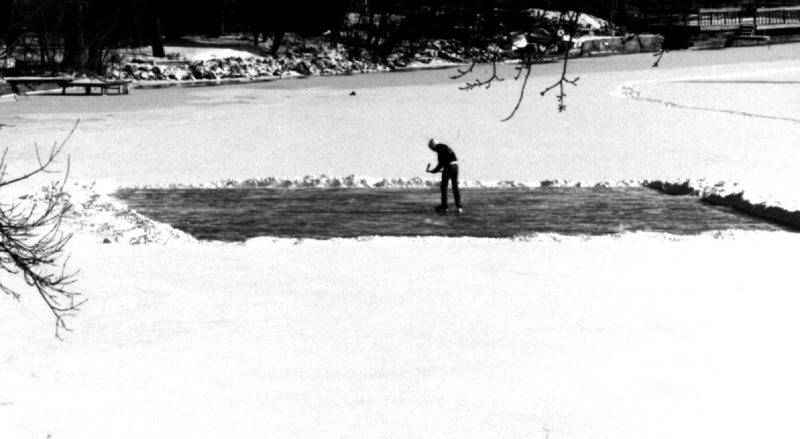 Workers, usually hobos, were hired to harvest the ice. The first part of the process was to score the ice. This was sometimes done with a wooden rake that had nails on it. The nails were positioned a certain distance apart to conform to the size of an ice block. A horse drawn ice plow was then dragged across the scored areas to cut the ice almost all the way through. It could be dangerous work and there were some tragedies. One of the more common occurrences was thin ice. The horses pulling their heavy plows sometimes fell through the ice. Workers would rush to tie a rope around the horse's neck and then pull the animal out of the cold water. After the ice cutting was completed the workers created a channel for the ice. Once the channel was made, every block would float down the channel. The operation of moving the ice was known as "live ice" and when the blocks would come to a stop that was called "dead ice." The ice house or ice barn that the ice was stored in had a narrow wooden ramp from the end of the lake to the ice house doors. A pulley would drag up the ice on the ramp. The ice house had layers of sawdust or straw, which was used to cover the ice. When it was time to transport the ice it was loaded on to railroad cars and shipped to the meat packing companies. Ice harvesting operations were discontinued after the invention of mechanical refrigeration in 1913. The lake’s ice operation was in production from about 1898 to approximately 1914. The buildings remained vacant for the next six years. On September 2, 1920 the Consumer Ice Company sold the land to Charles M. MacFarlane. Another party bought the ice house and boarding house, which were torn down shortly thereafter. After the Native Americans and the United States signed the treaty in 1833 arrangements were made to survey the land. The survey work for Avon Township was finalized December 8, 1840. It shows that the land at that time was covered with vast areas of prairie and timber. Prior to the survey, building a house, putting up a fence around the land or marking the land with cut-down trees provided temporary evidence of land claimed. This procedure conferred pre-emption or “squatters rights” for settlers who later wanted to file claims for the surveyed land. Elijah Haines wrote in his book, Portrait and Biographical Album of Lake County, Illinois, that a man named Taylor might have been the first settler in Avon Town-ship. Haines indicated that Taylor Lake took its name from that gentleman who settled on the land in 1835. Taylor’s claim of land where he built his log house was on the north side of the lake. Haines mentioned that Taylor held the land un-til 1837 when it was turned over to Leonard Gage. Haines’ narrative suggests that Leonard Gage continued to re-side on the premises once occupied by Taylor. On April 21, 1857 Gages’ claim, filed with the Gen-eral Land Office, reflects his purchase of land in Avon Township. The land purchased included land on Taylor Lake. Gage kept the land until approximately 1861. He died on January 20, 1880. Maps from 1847 reflect that Joseph and Charles Litwiler owned land on Taylor Lake. The Litwiler farm encompassed the northwest and west shores of the lake. One resident thought that the entrance to the Litwiler farm was on west shores of the lake (Hainesville Road) and the stone pillars that stand there today marked the farm’s entrance. On the Litwiler farm, near the banks of Taylor Lake, there was a blacksmith and wagon shop, which was run by Charles Litwiler. Other landowners between 1907 and 1915 include Christina Okoniewski, Cassius Doolittle, and J. W. Thompson. Leonard Doolittle owned land on the lake beginning in the late 1800s. In 1885, a portion of Doolittle's property became important in the Taylor Lake history as small lakes were being sought out for ice harvesting operations. Doolittle died in a fire that destroyed his farmhouse in January, 1886. He left a widow, four sons and three daughters. On June 11, 1906 the Doolittle “Taylor’s Lake” subdivision was established on the northeast corner of the lake. Shortly after the Native Americans were relocated, the new territory took on organization and structure. The northeast part of Illinois was divided as LaSalle and Cook Counties in 1835. McHenry County, including the land that makes up Lake County today, was created in 1837 out of the land in the northern parts of LaSalle and Cook Counties. The business people, farmers and landholders living east of the Fox River believed that McHenry County was too large to meet their needs. In August 1839 it was voted to divide the county down the middle of the Fox River. The land east of the Fox River was purchased on April 20, 1841 and named Lake County. In 1849 Lake County adopted the township form of government and created 15 townships. Avon Township, where Highland Lake is located, is identified as Township 45, Range 10 east. It is six miles long and four miles wide. The name for the township was decided at a meeting. Names presented for the township, among others, were Hainesville and Eureka. The residents were not happy with either name and the naming of the township became a controversial issue. On January 21, 1850 it was agreed to name the township Avon. Some say that it was named after the town of Avon in New York where many of the people previously lived. Others say it was named after the Avon River in England. The Highland Lake Community is surrounded by some of the earliest populated towns in Lake County. Hainesville is to the south. It was incorporated in 1847 and is the county’s oldest incorporated village. The town is named after Elijah Haines. Haines came with his family to the area as a child in 1836. As an adult he became a lawyer and legislator. His contributions to Lake County include surveys of the area and historical books. The village of Grayslake lies to the south and southeast of Highland Lake. This town was established in 1895 and takes its name from a William Gray who settled near a lake in that area. The village of Round Lake was incorporated on December 14, 1908. It is west of Highland Lake. Round Lake Beach, located north of Highland Lake, was incorporated in 1936. For a time the village was to select a name other than Round Lake Beach because there already was a Round Lake in Illinois. After a time, the village got its requested name. The village of Round Lake Park is located southwest. It was incorporated in 1947. Many summer homes were in the area and became year-round residences sometime after 1947.